Is there a specific error you are seeing? What compose file are you using? The one which is given in manual. Which command are you trying to run? If you want to run queries, you should use ratel UI to run queries. You can also use tour.dgraph.io and run queries on your machine. just trying to install DGraph. So I was followimg instruction from.manual. You can skip those instructions. Those instructions are needed if you are not using docker-compose. Invalid mode…what does it mean? Take out the volume params in the command. “-v ~/dgraph:/dgraph” - As You’re using Windows with a simulated linux terminal. So I guess This param don’t work on Windows. 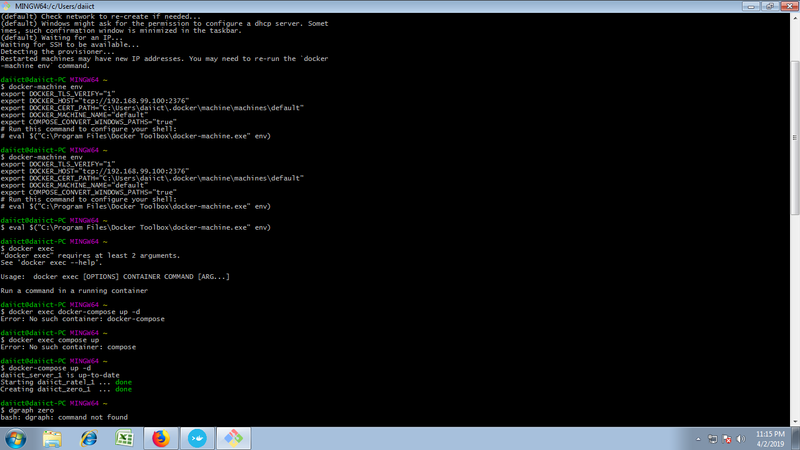 Switch to CMD or Powershell and follow the instructions for Windows in the Docker documentation. Or just remove the volume param. OR some other binarie instead of bash. Alternatively you do not need to use Docker. Just download the dgraph.exe binary and run locally. 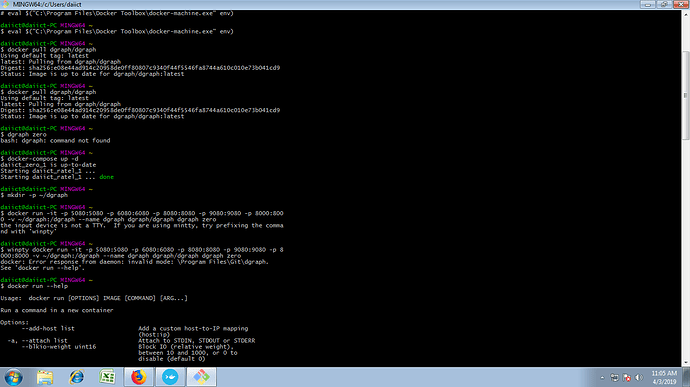 Btw this .exe format will be applicable to distributed DGraph or not? I mean I need to connect two machine in distributed manner for DGraph. So will it work? Btw this .exe format will be applicable to distributed DGraph or not? All builds of Dgraph works the same. Maybe some flags works differently on Windows context. But it will work as intended. Okay but localhost:8000 is not connecting to server while running DGraph-ratel.Any tips? Ratel has another binary. “dgraph-ratel.exe” so are you using it? What are the logs from it? Yeh I tried but it is showing address already in use. Change the addr and port. Or check what is using it. But in play.dgraph.io mutations are not allowed. Anyway to resolve that issue?